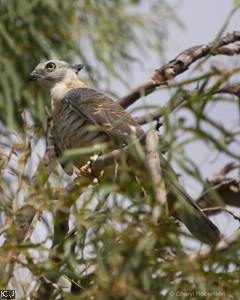 The Pacific baza ranges in size from 35-46 cm long with the female being larger than the male, it is occasionally seen soaring above the campus. Head bears a short crest, upperparts are grey as is the chest, wings are darker. Underwings and undertail rufous, abdomen is whitish with rufous bars. Legs and feet grey, eyes yellow, bill dark grey.